Essential for ensuring the body’s acid-base balance. Vital for nerve transmission and cardiovascular health. For several decades, scientists have been exploring a line of enquiry that may explain the rise in certain ‘modern’ diseases linked to diet: acid-base balance. For the body to function properly, it must maintain a balanced pH - neither too high (too acid) nor too low (too alkaline) - ensuring a ‘basic’ ie, slightly alkaline, arterial ph, between 7.34 and 7.45. • alkalinising foods such as fruit and vegetables (root and tuberous) provide alkaline potassium salts. Until the end of the Paleolithic period, our prehistoric ancestors had a highly alkaline diet, due to its very high potassium salt content (two to three times more than in today’s diets) which easily neutralised the acids produced by dietary metabolism. Modern diets, however, with their excessive meat, cheese and salt-enhanced cereal content, are leaving our bodies awash with chronic acidosis. Potassium is a trace-element which plays an essential role in the body. Located in cells in the form of the potassium cation K+, it is primarily involved in regulation of cardiac function, neuromuscular excitation and acid-base balance. Potassium is not naturally present in the body and must therefore be obtained from the diet. Foods rich in potassium include fruits and vegetables such as spinach, squash and bananas. 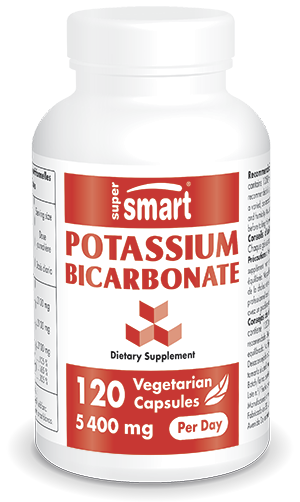 Other forms of potassium such as potassium bicarbonate are available in dietary supplement form. Potassium bicarbonate or potassium hydrogenocarbonate (KHCO3) thus plays an essential role in regulating acid-base balance. A supplement can restore blood pH within a relatively short time (just two to three weeks) and prevent the loss of dry mass from bones and muscles. Supplementation may therefore be necessary when the diet is too rich in animal protein (meat, fish, eggs or dairy products) and also to prevent the development of kidney stones and uric acid crystallisation that accompany age-related decreases in kidney function. Sportspeople can also benefit from supplementation since they consume higher than average amounts of protein and produce more lactic acid. One study of 18 menopausal women over three weeks revealed the benefits of potassium bicarbonate supplementation on bone metabolism, demonstrating that it reduced bone resorption and increased bone formation, while decreasing urinary calcium excretion. Potassium also plays an essential role in the cardiovascular system; indeed the US Food and Drug Administration (FDA) has recognised its health benefits for heart pump function and for lowering blood pressure. The Intersalt study, investigating 10,000 participants in 52 populations across 32 countries, clearly demonstrated the protective effects against high blood pressure of a higher potassium intake. An increase in daily potassium intake from 1.17g to 1.35g was associated with a reduction in systolic pressure of 2-3mm Hg. The famous DASH diet (Dietary Approaches to Stop Hypertension) is characterised by higher fruit and vegetable consumption which also raises daily potassium intake, mainly in its bicarbonate form, from 1.44 to 2.77g. This was shown to lower systolic and diastolic blood pressure by 5.5mm and 3mm Hg respectively after eight weeks. An American study that monitored 45,000 health professionals over eight years showed that stroke risk is associated with daily potassium intake, this risk decreasing by 38% when potassium intake increased from 2.39g to 4.29g.